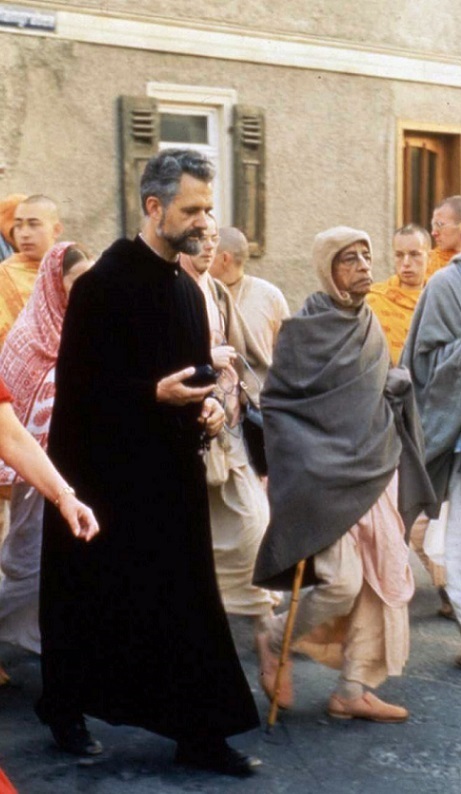 What Did Prabhupada Say About Jesus? Guest: How would His Grace see Jesus Christ? Devotee: What is our view of Lord Jesus Christ? Prabhupāda: Jesus Christ, Lord Jesus Christ, is... He is son of God, the best son of God, so we have all respect for him. Yes. Anyone who is teaching people about God consciousness, he is respectful to us. It does not matter in which country, in which atmosphere, he was preaching. It doesn't matter. "Who will not respect Jesus Christ? He sacrificed everything for God, even his life. So who is that rascal that he'll not respect to Jesus Christ? What did he do wrong to the human society? He did everything for the good of the human society. Oh, I have got very, very great respect for Lord Jesus Christ. Not only... Every, I mean to say, God conscious man, he must have respect for Jesus Christ. There is no doubt about it. My Guru Mahārāja had very great respect for Muhammad, Jesus Christ..."
"Jesus Christ was such a great personality—the son of God, the representative of God. He had no fault. Still, he was crucified. He wanted to deliver God consciousness, but in return they crucified him—they were so thankless. They could not appreciate his preaching. But we appreciate him and give him all honor as the representative of God. Of course, the message that Christ preached was just according to his particular time, place, and country, and just suited for a particular group of people. But certainly he is the representative of God. Therefore we adore Lord Jesus Christ and offer our obeisances to him." "Christ says he is son of God. And Kṛṣṇa says, 'I am God.' So where is the difference? The son will say the same thing, the servant will say the same thing, and the father also will say the same thing. So theology means to know God and abide by His order." "One must be very merciful. Vaiṣṇavas, they are merciful. All devotees of God, Vaiṣṇava, they are merciful. You know Lord Jesus Christ, how he was merciful." "Just like Lord Jesus Christ. He was being crucified. Still, he was saying, 'My father, they do not know what they are doing.' Is it not? He is so much compassionate that 'These rascals do not know what they are doing, rascals. Still, I request You to forgive them.' This is Vaiṣṇava. Personally he is suffering, but he is still compassionate." "Lord Jesus preached the message of God and I have taken up the same mission, and it would be a good luck for me if I can follow the foot prints of Lord Jesus who preached the message of God in spite of all persecution. Lord Jesus is a living example how one has to suffer in this material world simply for the matter of preaching the message of God." "A Vaiṣṇava, or devotee of Lord, his life is dedicated for the benefit of the people. You know—most of you belong to Christian community— how Lord Jesus Christ, he said that for your sinful activities he has sacrificed himself. That is the determination of devotee of the Lord. They don't care for personal comforts. Because they love Kṛṣṇa or God, therefore they love all living entities because all living entities are in relationship with Kṛṣṇa. So similarly you should learn. This Kṛṣṇa consciousness movement means to become Vaiṣṇava and feel for the suffering humanity." He is the seed-giving father for all living entities. So Kṛṣṇa is for everyone. Don't think that Kṛṣṇa, as it is stated in your English dictionary, 'Kṛṣṇa is a Hindu God.' He's not Hindu, He's not Muslim, or He's not Christian. He's God. God is neither Hindu nor Muslim nor Christian. It is bodily designations, 'I am Hindu, you are Christian.' This is bodily... Just like dress. You have got some black coat. Another has got some white coat. That does not mean we are different because we are in different coat or shirt. As human being, we are all sons of God. We are one. That is the conception. So at the present moment, we have divided the world on account of this shirt and coat. That is not... That is not good. Actually, the whole world or the whole universe belongs to God. This is Kṛṣṇa consciousness."